Hoekstra, Carlijn Venekamp, Roderick and van Zanten, Bert 2015. Tinnitus. Huisarts en wetenschap, Vol. 58, Issue. 10, p. 548. Smith, Gregory S. Romanelli-Gobbi, Massi Gray-Karagrigoriou, Elizabeth and Artz, Gregory J. 2013. Complementary and Integrative Treatments. Otolaryngologic Clinics of North America, Vol. 46, Issue. 3, p. 389. Dauman, Nicolas and Erlandsson, Soly I. 2012. Learning from tinnitus patients' narratives—A case study in the psychodynamic approach. International Journal of Qualitative Studies on Health and Well-being, Vol. 7, Issue. 1, p. 19540. Bauer, Carol A. 2010. Cummings Otolaryngology - Head and Neck Surgery. p. 2131. Scurlock, Joann and Stephens, Dafydd 2008. A ringing endorsement for Assyro-Babylonian medicine: The diagnosis and treatment of tinnitus in 1st Millenium BCE Mesopotamia. Audiological Medicine, Vol. 6, Issue. 1, p. 4. Mirz, F. Zachariae, R. Andersen, S. E. Nielsen, A. G. Johansen, L. V. Bjerring, P. and Pedersen, C. B. 1999. The low-power laser in the treatment of tinnitus. Clinical Otolaryngology and Allied Sciences, Vol. 24, Issue. 4, p. 346. Andersson, Gerhard Melin, Lennart Hägnebo, Christina Scott, Berit and Lindberg, Per 1995. A Review of psychological treatment approaches for patients suffering from tinnitus. Annals of Behavioral Medicine, Vol. 17, Issue. 4, p. 357. MARION, MITCHELL S. and CEVETTE, MICHAEL J. 1991. Tinnitus. Mayo Clinic Proceedings, Vol. 66, Issue. 6, p. 614. 1991. Letters to the Editor. Tropical Doctor, Vol. 21, Issue. 3, p. 119. George, Richard N. and Kemp, Simon 1991. A survey of New Zealanders with tinnitus. British Journal of Audiology, Vol. 25, Issue. 5, p. 331. Erlandsson, S. Ringdahl, A. Hutchins, T. and Carlsson, S. G. 1987. Treatment of tinnitus: A controlled comparison of masking and placebo. British Journal of Audiology, Vol. 21, Issue. 1, p. 37. Rubinstein, Barbara and Carlsson, Gunnar E. 1987. Effects of Stomatognathic Treatment on Tinnitus: A Retrospective Study. CRANIO®, Vol. 5, Issue. 3, p. 254. Hazell, J. W. P. Wood, S. M. Cooper, H. R. Stephens, S. D. G. Corcoran, A. L. Coles, R. R. A. Baskill, J. L. and Sheldrake, J. B. 1985. A clinical study of tinnitus maskers. British Journal of Audiology, Vol. 19, Issue. 2, p. 65. Department of Audiological Rehabilitation Royal National Throat, Nose and Ear Hospital, London. S. D. G. Stephens, Audiology Centre, The Royal National Throat, Nose Ear Hospital, Gray's Inn Road, London, WCX DA. Paper read at the meeting of the British Tinnitus Association, London, 6th November, 1982. Adams, F. (1844) (Transl.) The seven books of Paulus Aeginata. Vol. I, LondonSydenham Society. Anon, (1964) Avicenna—Libera Canonis. Hildesheim, George Olms. Anon, (1978) Culpeper's Complete Herbal. London, Foulsham. Bellows, H. P. (1896) A case of ligation of post auricular vessels for the relief of tinnitus aurium. Journal of Ophthalmology, Otology and Laryngology, New York, 8: 187–191. Bostock, J. and Riley, H. T. (1856) (Transl) The Natural History of Pliny. Volume V. London, H. G. Bohn. Brenner, R. (1868) Untersuchungen und Boebachtungen auf dem Gebiete der Elektrotherapie Leipzig, Giesecke u Devrient. Cited by Hartmann, A. (1887) Diseases of the Ear, Edinburgh, Pentland, pp. 69–71. Brown, R. D., Penny, J. E., Henley, C. M., Hodges, K. B., Kupetz, S. A., Glenn, D. W. and Jobe, P. C. (1981) Ototoxic drugs and noise. In Evered, D. and Lawrensen, G. (eds.) Tinnitus. Ciba Foundation Symposium 85, London, Pitman, pp. 151–171. Burnett, C. H. (1894) Three cases of Chronic tinnitus aurium and tympanic vertigo relieved by removal of the incus. Medical News, Philadelphia. 64: 452–454. Curtis, J. H. (1831) A treatise on the physiology and pathology of the ear. 5th edition. London, Longman, Rees, Orme, Browne and Green. Darwin, E. (1796) Zoonomia, Vol. 2. London, J. Johnson. Davies, H. E. F. and Owen, M. E. (1975) Meddygon Myddfai. In Cule, J. (ed) Wales and Medicine. Llandysul, British Society for the History of Medicine, pp. 156–168. Dench, E. B. (1912) Division of the auditory nerve for persistent tinnitus. Interstate Medical Journal, 19: 29–34. Diverres, P. (1913) Le plus ancien texte des Meddygon Myddven. Paris, Marcel Ie Dault. Duel, A. B., (1915) Report of an unsuccessful labyrinthectomy for relief of distressing tinnitus aurium. Trans actions American Laryngological, Rhinological and Otological Society, 21: 130–137. Du Verney, G. J., (1683) Traite de l'organ de l'ouie. Paris, Michallet. Fowler, E. P. (1948) The emotional factor in tinnitus aurium. Laryngoscope, 58: 145–154. Getz, F. M. (1981) An edition of the middle english Gilbertus Anglicus found in Wellcome S 537. Unpublished PhD thesis. University of Toronto. Chapter 4, Pt. 5. Hansen, P. E., Hansen, J. H. and Bentzen, O., (1982) Acupuncture treatment of chronic unilateral tinnitus—a double blind cross-over trial. Clinical Otolaryngology, 7: 325–329. Hazell, J. W. P., (1979) Tinnitus. In Ballantyne, J. and Groves, J. (eds.) [Scott-Brown's Diseases of the Ear, Nose and Throat] London, Butterworths. Fourth edition. Volume 2, pp. 81–91. Huang, H. L. (1974) (Transl.) Ear acupuncture. Emmans, Pennsylvania, Rodale Press. Itard, J. M. G., (1821) Traité des maladies de l'oreille et de I'audition. Paris, Mequignon—Marvis. Jones, I. H. and Knudsen, V. O., (1928) Certain aspects of tinnitus, particularly treatment. Laryngoscope. 38: 597–611. Kamal, H., (1968) A dictionary of pharaonic medicine. Cairo, National Press House. Kuhn, C. G. (1965) (ed.) Claudii Galeni Opera Omnia. Vol. 14. Hildesheim, George Olms. Lane, H., (1976) The wild boy of Aveyron. Cambridge, Mass., Harvard University Press. Lawn, B., (1963) The Salernitan Questions. Oxford, Clarendon Press. Littre, E., (1840) Oeuvres completes d'Hippocrate. Volume 2, pp. 506–509. Paris, Bailliere. Lloyd, G. E. R. (1978) (Ed) Hippocratic Writings. London, Penguin. McNaughton-Jones, H., (1891) Subjective noises in the head and ears: their aetiology, diagnosis and treatment. London, Balliere, Tindall and Cox. Ogden, M. S. (1971)(ed.) The Cyrurgie of Guy de Chauliac. London, Oxford University Press, pp. 473–474. Opsomer-Halleux, C., (1981) Le nez, le gorge, et les oreilles dans les manuscrits medicaux de 1'antiquite et du moyen age (receptaires er antidotaires) Acta Otolaryngologica Belgica 35. supplement. 4: 1583–1599. Politzer, A., (1907) Geschichte der Ohrenheilkunde. Vol. 1. Stuttgart, Enke Verlag. Pughe, J. and Williams ab Ithel, J., (1861) (Transl.) The physicians of Myddvai. Llandovery, Roderic. p. 117. Reyburn, R., (1879) Persistent tinnitus aurium, followed by symptoms of cerebral embolism; successfully treated by ligation of posterior occipital artery. National Medical Review, 1: 42–45. Reymond, E. A. E. (1976) (ed.) A medical book from Crocodilopolis, p. 105. Wien, Bruder Hollinek. Rolleston, J. D. (1942) Otology and Folklore. Journal of Laryngology and Otology, 57: 311–318. Ross, W. D. (1927) (ed.) The works of Aristotle. Volume 7 Problemata. (Transl. Forster, E. M.). Oxford. Clarendon Press. Saltzman, M. and Ersner, M. S., (1949) Tinnitus aurium in otosclerosis. Archives of Otolaryngology. 50: 440–442. Sigerist, H. E., (1951) A history of medicine. Vol 1. Primitive and archaic medicine. New York. Oxford University Press. Spalding, J., (1903) Tinnitus, with a plea for its more accurate notation. Archives of Otology, 32: 263–272. Spencer, W. G. (1938) (Transl.) Celsus—De Medicina. London, Heinemann, Vol. II. Stephens, S. D. G. (1981) L'Audiometrie: un apercu historique. In Willemot, J. (ed.) Naissance et developpment de l'Oto-Rhino-Laryngologie dans l'histoire de la medecine. Acta oto-rhino-larvngologica Belgica, Supplement 3: 1399–1425. 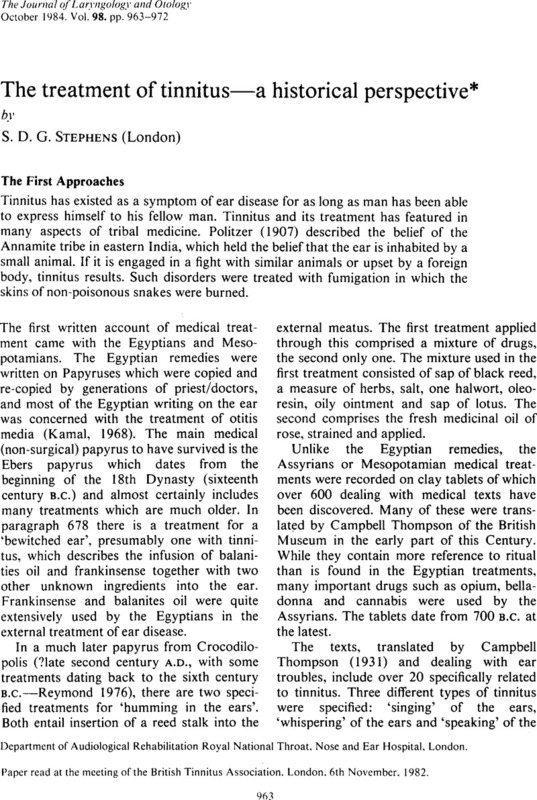 Thompson, R. C. (1931) Assyrian prescriptions for diseases of the ears. Journal of the Royal Asiatic Society. 1–25. Thornton, N. T. (1980) The power of Paracelsus. History of Medicine, 8: 10–15. Vernon, J., (1981) The history of masking as applied to tinnitus. Journal of Laryngology and Otology. Supplement 4: 76–79. Webfer, J. J. (1727) Observationes medico-practicae, de affectibus capitis internis et externis, p. 141. Schaffhausen, Ziegler. Wibel, G. D. (1768) Casum aegroti auditu difficili, p. 22, Argentorati, J. H. Heitzii. Wilde, W. R. (1853) Practical observations in aural surgery. London, Churchill. Wilson, H., (1893) Vibratory massage of the middle ear by means of the telephone. New York Medical Journal. 57: 221–222. Wright, W., (1925) Examination of popular remedies. The Aurist, 1: 8–18; 36–40: 69–76.